So what do you get for five bones a month? Some of the tracks and the "no preview" function. Specifically, the full paid library is 150 million tracks, while the $5 version is limited to 120 million. That seems like a pretty good deal, so long as you don't mind getting previews. SoundCloud's press release does say that the company will be announcing more exclusive features for the pricier Go+ tier later this year, but so far there's no indication of what they might be. 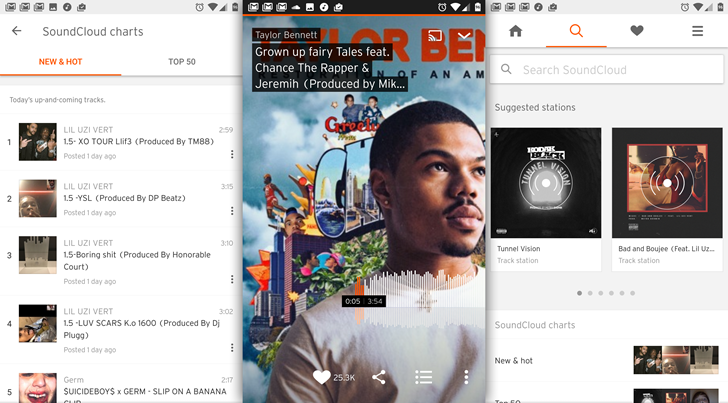 SoundCloud Go and Go+ don't require a contract and can be purchased using the Play Store's recurring payment system. NEW YORK--(BUSINESS WIRE)--In a move to offer SoundCloud’s highly engaged, on-the-go audience more choice in how they experience SoundCloud, the company announced today its new, mid-priced subscription plan that takes SoundCloud’s ad-supported offering offline and ad-free for $4.99 per month. Beginning today, SoundCloud’s mid-priced subscription plan becomes SoundCloud Go, while SoundCloud’s existing premium music subscription plan, launched last year as SoundCloud Go, is now SoundCloud Go+. The new SoundCloud Go plan marks a music industry first by offering a fully on-demand, mid-priced music streaming subscription. SoundCloud Go lets listeners discover, stream and share a constantly expanding mix of more than 120 million tracks from established and emerging artists, offline and ad-free for $4.99 per month. SoundCloud Go+, formerly known as SoundCloud Go, is SoundCloud’s premium subscription offering which gives subscribers full access to more than 150 million tracks, ad-free, offline with no previews for $9.99 per month. Additional exclusive product features for SoundCloud Go+ will be announced later this year. SoundCloud Go and SoundCloud Go+ are available through SoundCloud's existing apps on the iOS App Store, Google Play or by logging on to soundcloud.com/go in the US, UK, Ireland, France, Australia, New Zealand, Canada and Germany. 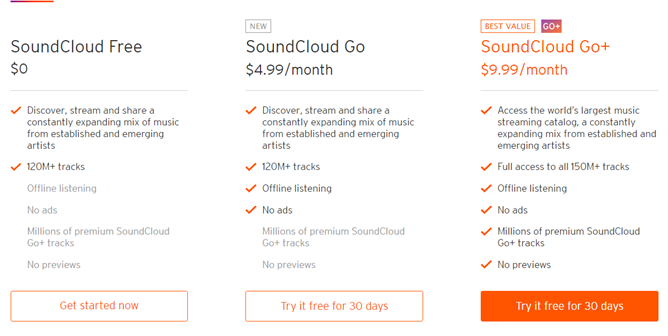 Users can sign up for a free, 30-day trial of SoundCloud Go or SoundCloud Go+, after which a monthly subscription fee applies: SoundCloud Go is $4.99 (web/Android)/$5.99 (iOS) per month, and SoundCloud Go+ is $9.99 (web/Android)/$12.99 (iOS) per month. iOS users can avoid the App Store surcharge by visiting soundcloud.com/go instead.